There he was, standing in the grand podium where the likes of LeBron James and Michael Jordan have been before. He was ready to accept the most important NBA award for an individual’s accomplishments throughout the grueling 82-game season. On his left were the teammates he carried while Russell Westbrook was out. A lot of people wrote them off the playoff picture, with many thinking that the OKC Thunder needed 2 all-stars to, at least, remain competitive. On his right was the now retired commissioner, David Stern, ready to hand the 58th Most Valuable Player award that the league has awarded. The pack of media are preparing their notes and cameras, ready to ask questions on where the new MVP will go from here. But KD is zoning out. He loves to do that, when he wants to do something great – ask the 29 teams what fears them the most about Durant, and it’s when he has that look in his eyes which signals that he’s ready to take over. The first time that happened was in his living room as a kid. After playing countless of hours playing basketball in the neighborhood court, Kevin would watch his favorite team, the Toronto Raptors, and the high-flying antics of Vince Carter right after. Unknown to him was his mother, Wanda Pratt, crying in her bed while thinking about how to survive tomorrow, the day after tomorrow, this week, next week, and even months. She was working two jobs, not having enough time to get a good night’s sleep and to take care her 4 children. Money was tight. Her mother and sister had enough to help Wanda, but “Mama Durant” had enough pride to show that she can, and she will rise up from this. 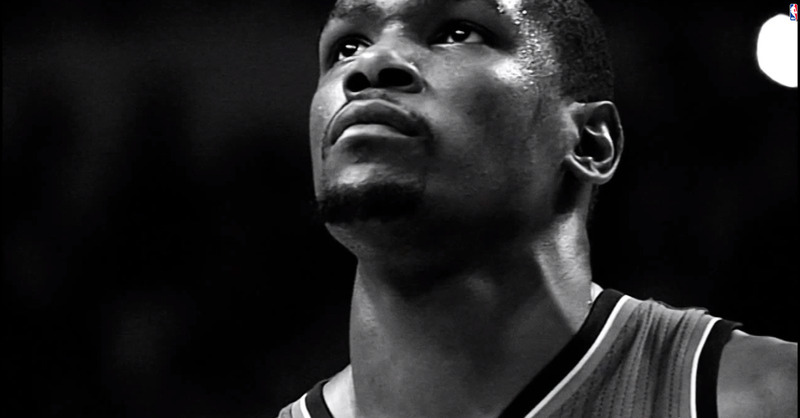 Kevin Durant has that same pride to know what he’s capable of. Blessed with a body built to terrorize his opponents on the court, Kevin Durant started playing on the Amateur Athletic Union (AAU) where he met future NBA players Ty Lawson, Greivis Vasquez, and Michael Beasley. Soon, everyone even outside of his hometown, Maryland were hearing the buzz of a lanky guard player destroying the AAU circle. They will realize fast the hype was real. It would all come down to Kevin Durant when he suffered his real loss – Charles Craig. “Big Chucky,” as Kevin likes to call him when touring the AAU circuit, was murdered in 2005, 2 years before Kevin Durant would get drafted. Even today, KD’s face would swell up when talking about his first coach. He has changed his jersey from “3” to “35,” commemorating the number of years that his friend has lived. Since then, he reads the bible just before tip-off, and raises his hand and point to the sky every time he makes a three or a clutch shot to tie or win the game. Recruiters from all around the nation were wooing Durant to join their program, after being named the State Player of the Year. Already, NBA executives were filing names on the trade list in exchange for a couple of 2007 NBA Draft picks, the most possible year Kevin would join. He went on to University of Texas, teaming up with DJ Augustin, while averaging close to 26 points and 11 rebounds per game. His accolades continued to rack up, winning the college’s own NBA MVP award, the Naismith Player of the Year. Despite playing only one season for UT, his #35 jersey was retired by the Longhorns. Kevin Durant finally joins the NBA, when the Seattle SuperSonics drafted him the #2 overall pick of the 2007 NBA Class. It didn’t take long for Kevin Durant to punish the Portland Trailblazers for picking Greg Oden over him. Scouts described him as a “scoring prodigy,” but they didn’t take into account his abilities to be one of the great all-around players in the game. Westbrook and Ibaka were drafted the following year (the same time they moved to OKC), with James Harden joining them the year after. A heck of a core for a new and rebuilding team. The investment, and the patience of the Oklahoma City Thunder management and fans, proved to be a great move as they were creeping past the rebuilding status and on their way to being contenders. The ’09-’10 season proved to be the pivotal year to reclaim their glory, as they finished the season with a record of 52-30. They couldn’t get past the defending champions in the playoffs (Los Angeles Lakers won their 2nd consecutive title), but it was a great time to be an OKC fan. The next season saw them inching to the NBA Finals door, before losing to Dallas in the Western Conference Finals. They were ready. They knew that. The ’11-’12 lockout season proved they have enough experience to push themselves over the hump. This was the year Kevin Durant became the 2nd best player in the NBA – behind LeBron James. He carried the OKC Thunder to their first ever NBA Finals appearance against LeBron’s Miami Heat. It was the match-up that everyone wanted, two players ready to go at it a la Larry Bird and Magic Johnson. Kevin Durant was the better scorer, but LeBron was the better player. James and the Heat eliminated the OKC Thunder in 5 games. He covered his face with a towel, walking his way towards the tunnel. Russell Westbrook, the team’s vocal leader, didn’t say anything but was looking at KD as if to ask, “what’s next for us?” KD couldn’t give a definite answer. He was zoning out again with a long off-season that is sure to follow. He couldn’t find the answers that would help him clear his mind of the things that went wrong from a lost season. He raised his head, and saw his mother ready to hug him. Kevin’s brothers were there to pat his back. He found the answers. He found comfort. He found his family. He focuses on his family, who are sitting in the very first row, right in front of him. He thanked God for all the blessings that he received. He thanked his teammates, especially Russell Westbrook (who he often clashes with), for challenging him to be a better player. Lastly, he thanked his mom. Reliving all the nightmares they had to endure, his mom never gave up on Kevin as he didn’t gave up on his mom and his family. She was the real MVP. Now, Kevin Durant is trying to carry an OKC team which is currently out of the playoffs (17-19 record as of this writing, 4 games behind 8th spot). He started the season with a Jones fracture on his right foot while Russell Westbrook had broken his right hand, but now they’re healthy and finding their groove. He’s fighting for Coach Craig, for the OKC fans who never failed him, and for his family, all because they fought his battles. Kevin Durant is not just another MVP in the long list of winners in NBA history. He changed the idea of what an MVP should be. This entry was posted in Basketball, NBA and tagged Durant, KD, Kevin Durant, NBA, NBA Playoffs, OKC Thunder, Oklahoma City, Oklahoma City Thunder. Bookmark the permalink.